Uber in France: Ridesharing app that led to violent protests shuts down until court rules on law. A taxi blocks the area of Porte Maillot in western Paris on June 26, 2015, during a protest by drivers who say Uber’s ridesharing app UberPop presents unfair competition. Several days after sometimes-volatile protests by taxi drivers who say Uber’s service is not competing on a level playing field, the Los Angeles Times reports that Uber suspended the use of its ridesharing app in France on Friday. The cheap ride-share business, called UberPop in France, connects passengers with unregistered drivers, a move that has been met with anger from taxi drivers who must buy an expensive license that can cost up to $270,000 and who say the competition is destroying their livelihood. Other Uber services using professional drivers were not affected by the decision, the company said. Although ordered closed by French authorities, UberPop initially said it would not stop operating as it awaited a decision by the country’s top court. On Friday, [Uber France chief Thibaud] Simphal backtracked from that hard-line stance and suggested that the company would suspend its services until the court makes its ruling on the law that handles taxi competition, expected in September. Reuters notes that Uber has faced increasing scrutiny and restriction in recent months from authorities in European countries, including Italy and Germany, and that the company’s flouting of the law in France had resulted in two of its executives being taken into custody. The arrival of Uber in France has evidently brought political attention to one grievance that originates not with the people who drive taxis for a living, but from the people who pay to ride in them. 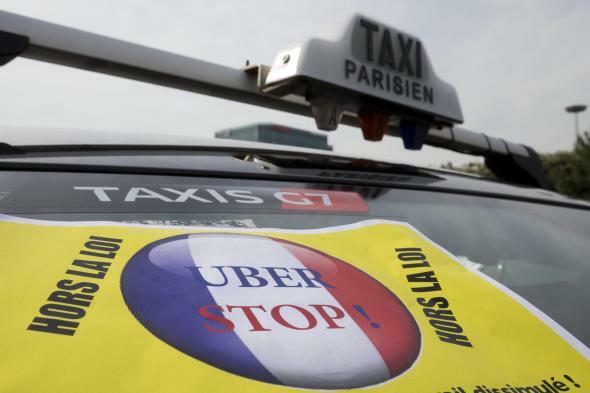 Reuters adds that Prime Minister Manuel Valls, responding Friday to the announcement that UberPop was shutting down, admitted that France’s licensed taxis often gave both locals and foreign visitors lousy service.